Max Solbrekken World Mission: Research shows that children raised by both their parents in the home benefit greatly. They do better in school, are less likely to use illegal drugs, have fewer teen pregnancies and are less likely to get in trouble with the law. Research shows that children raised by both their parents in the home benefit greatly. They do better in school, are less likely to use illegal drugs, have fewer teen pregnancies and are less likely to get in trouble with the law. Marriage is a great anti-poverty program. So why does government discourage it? It’s National Marriage Week USA from now through the end of Wednesday (Valentine’s Day). The week is designed to promote the benefits of marriage – financial stability, better health, greater happiness and healthier kids. Other goals are to strengthen individual marriages, reduce the divorce rate and build a culture that fosters strong marriages. Marriage is one of the most effective anti-poverty programs around. But far too often, government assistance programs for people with low incomes discourage marriage, because tying the knot reduces government welfare assistance payments. For example, let’s say a couple is living together, unmarried, with their two children. Each partner has a low-wage job and a poverty-level income. The single mother and her two children get payments through the Temporary Assistance for Needy Families program run by the federal government and their state. But if the mother marries the father, their combined income is just a bit too high to quality for government assistance – so they lose their monthly payment. To avoid that, the two don’t get married. According to the Brookings Institution, the U.S. would have 25 percent less poverty today if we had the marriage rates we had in 1970 (79 percent of U.S. adults were married then, versus only 52 percent today). Cutting the poverty rate by a quarter would of course benefit individuals who escape poverty, and also benefit government and taxpayers by cutting the amount that needs to be spent on assistance to poor people. And according to the Heritage Foundation, when parents are married the probability of a child living in poverty drops by an amazing amount – 82 percent. On top of this, a 2008 report by the Institute for American Values estimated that taxpayers spent $112 billion a year for divorce and unwed childbearing. Adjusting that for inflation and the continued rise of both those family situations would make the cost substantially higher today. A new Minnesota law enacted last year with bipartisan support and going into effect in August attempts to remove the marriage disincentive and could serve as a national model. The Minnesota law increases the family income threshold to allow couples to continue receiving government benefits for one year following a new marriage, as long as family income is no higher than 275 percent of the federal poverty level. The new law was proposed after clergy reported to Minnesota activists that single mothers who would like to get married were refraining because their husband-to-be would not earn enough to compensate for the mother’s loss of benefits. This new law gives the couples 12 months to come up with a plan to become financially stable without government assistance. My aim as director of National Marriage Week USA is to strengthen marriages, and to get the word out that both the left and the right applaud marriage as a solution to poverty. 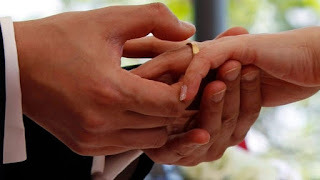 This effort is appealing to both progressives and conservatives, according to Minnesota activists Jason Adkins and Anne Kirsnik, who initiated the idea for the new law on benefits for married couples in that state. The bill passed in a Republican-majority state Legislature and was signed by a Democratic governor. Adkins said that progressives like the new law because they want to give a leg up to those in poverty with hopes of moving them further toward financial sustainability. Conservatives also care about alleviating poverty and want to promote marriage. There is no question that poverty and political acrimony are two significant issues that our country faces. As director of an annual campaign to strengthen marriage, I am encouraged that Minnesota officials from both political parties have addressed both with this law. It is my hope that other elected officials will follow in these footsteps and bridge the political divide to help American families. Sheila Weber is the executive director of National Marriage Week USA.